Enjoy your complimentary stay at the Hilton Vancouver Hotel. The evening is yours to venture into the city and independently explore local attractions. Our Hospitality Desk will be located in the hotel for your convenience between 3:00 p.m. and 7:00 p.m.. It is here that our friendly staff can assist with everything from general questions about your upcoming voyage to reserving Premium Shore Excursions. An American Queen Steamboat Company representative, as well as a local representative, will be readily available to provide you with dining, entertainment, and sight-seeing suggestions so that you may maximize your time in Vancouver. Today is the big day! Spend a few hours before your departure exploring the beautiful city of Vancouver. If you didn’t have a chance to check-in on the first night, the hospitality desk will be open today between 8:30 AM and 12:00 PM at the official Pre-Cruise hotel. During the easy check-in procedure, representatives will arrange your transfer to the vessel and answer questions regarding your upcoming voyage. The process is simple and will have you back to exploring or relaxing in no time. If you think of additional questions, the hospitality staff will be at your service until the transfers begin to take you to the American Empress. A six-mile paved walkway overlooking the beautiful Columbia River. In addition to the remarkable views, guests can explore the statues, shops, cafes, docks, and historic canneries dotting the path. Guests, who wish to, can choose to board the riverfront trolley that runs along the banks for an extra fee. The Astoria Riverwalk, also known as the Astoria River Trail, stretches the entire length of the city’s waterfront, connecting restaurants and breweries, museums, and dozens of other attractions. It passes under the Astoria-Megler Bridge, the largest continuous truss bridge in the United States, arcing out across the Columbia River toward the hazy hillsides of Washington state. The trail follows the route of the Astoria and Columbia River Railroad that was completed in 1898. As one of the best-preserved examples of Queen Anne architecture in the Northwest, the Flavel House survives today as a landmark of local and national significance. The house was built as a retirement home in 1885 for Columbia River bar pilot, Captain George Flavel, and his family. The Flavel House has been restored and furnished to portray the elegance of the Victorian period and the history of the Flavel family. Its decorative exterior, with hipped roof, balconies, and verandas, is distinguished by a fourth-story cupola. The interior of the home features original Eastlake influenced woodwork, period furnishings, six exotic hardwood fireplace mantels, and fourteen-foot ceilings with plaster crown molding and medallions. This magnificent monument stands 600 feet above sea level and gives the perfect view to Young’s Bay, the Coast Range, the Columbia River, and in the distance, even the Pacific Ocean. Ralph Budd initiated the project to celebrate Astoria’s early settlers. He hired Italian immigrant and artist Atillilio Pusterla to model a piece inspired by Trajan’s Column in Rome, featuring hand-painted spiral frieze work, stretching over 500 feet if it were to be unwound. The Astor family, with the help of the Great Northern Railroad, generously donated the column to Astoria in July of 1926. Astoria’s Old City Hall building, a neoclassical structure designed by prominent Portland architect Emil Schacht in 1904, is home to the Historical Society’s collection and archive. Clatsop County’s rich and exciting history is featured in the museum’s permanent and changing exhibit galleries. Objects on display include a 1,000-year-old hunting implement, finely crafted 19th-century Chinook and Clatsop Indian baskets, and a sea otter pelt and beaver hat which illuminate the early history of Astoria. Logging and fishing, the two economic mainstays since 1870, are represented in collections of tools, equipment, and photographs. The stories of the many diverse ethnic groups that settled in the area are depicted in the Emigrants Gallery. A recent addition to the Heritage Museum’s exhibits and located on the second floor, is “Vice and Virtue in Clatsop County: 1890 to Prohibition.” The gallery contains a partially reconstructed saloon and illustrates Astoria’s seedy past when the town was known along the West Coast for its infamous saloons and brothels. Enjoy the beautiful, paved walking trails, a pond, and scenic overlooks. The Discovery Center is located in a beautiful and unique ecosystem native to the area. The multimedia, interactive museum inspires appreciation and stewardship of the natural and cultural treasures of the gorge and Wasco County. Exhibits focus on the volcanic upheaval and raging floods that shaped the gorge, the unique flora and fauna of the region, and 11,000 years of cultural history. In addition to touring the many fascinating exhibits, visitors can spend time viewing the museum’s incredible Raptor Program, with live birds of prey presented daily or take the pond walk and view the native plants. In 1854, The Dalles was designated by the Territorial Legislature as the county seat of one of the largest counties ever formed in the United States. Wasco County extended from the crest of the Cascade Mountains to the Great Divide in the Rockies and encompassed 130,000 square miles. Construction began in 1858, under the supervision of Judge Orlando Humason, who was the first county judge and also the chairman of the Board of Commissioners. This small courthouse was used as a public meeting place, church services, as well as the seat of law for the county. Discover the history of this historic and beautiful city. Use this opportunity to learn about the many attractions and buildings, and get a listing of the best places to grab a bite to eat, get a fine glass of wine, find a pharmacy, or do the most unique shopping. The friendly hosts will assist you in any way possible while informing you about their hometown. Located in the former fort’s Surgeon’s Quarters built in 1856, the Fort Dalles Museum opened in 1905, making it one of Oregon’s oldest history museums. Take a tour of the unique collection of pioneer and military artifacts at one of the old west’s most pivotal places in history. Enjoy walking on the grounds of this military fort and viewing the historic collection of wagons and antique vehicles. The collection holds over 30 wheeled vehicles, including a stage coach, road-building equipment, a covered wagon, two horse-drawn hearses, the Umatille House bus, and a surrey once owned by Oregon’s seventh governor, Zenas Ferry Moody. Explore the hand-hewn log buildings of the Anderson Homestead, including the pioneer house, granary, and barn. The Dalles Commercial Historic District was listed in the National Register of Historic Places in 1986. Spend the day exploring this city’s extraordinary boutiques, exquisite cuisine, and beautiful historic structures. Walk the streets of this peaceful and quirky river-town and admire the intricate murals that line the walls and streets of The Dalles. A multitude of murals wrap around the city, depicting important moments in their history. This highly interactive museum is a favorite for many along the river. Enjoy a day of discovering the unique exhibits and artifacts that fill the museum. The mission of the Columbia Gorge Interpretive Center Museum is to share the story of Skamania County and the Columbia River Gorge. Make sure to visit “First People,” an exhibit focusing on the history of native people of this area – the cascade chinook. Then stop over at the “Grand Gallery” which is the largest gallery in the museum that showcases how to harvest resources and focuses on the timber industries throughout the gorge. One of the most popular exhibits is the large fish wheel located inside the premises and is a 37-foot replica of the McCord wheel built in 1882, equipped with baskets used to scoop fish as they swim through and six of them were created by Tiffany Studios in New York under the supervision of Louis Comfort Tiffany. Make a stop in Downtown Stevenson, where you can get a slice of what Stevenson is all about. Enjoy the many antique shops, historic buildings with vintage interiors, and beautiful, abundant gardens. Visit the boutiques and shops, restaurants, cafes, and convenience stores to treat yourself to a souvenir or a taste of the fine cuisine before heading to your next stop! Spend a leisurely day cruising through the scenic Columbia River Gorge. You may wish to relax on your veranda and take in the spectacular scenery, attend a discussion with our Riverlorian or enjoy a variety of onboard activities. If you prefer a day ashore, you can also choose a premium excursion that take you to the Pendleton factory while the vessel is underway. Richland is located near the confluence of the Yakima and Columbia Rivers, the northern most point reached by the Lewis and Clark Expedition in 1805. First incorporated in 1910, Richland remained a small agricultural community until the Army acquired it and 670 square miles of adjacent land in 1943 as the site of the Hanford Engineer Works which was used to produce plutonium during World War II and the Cold War. Today, the historic B Reactor and other important historical venues are part of the new Manhattan Project National Historic Park. The city is also home to the Pacific Northwest National Laboratory and a branch campus of Washington State University. In the year 2000, President Clinton established the 196,000-acre Hanford Reach National Monument, recognizing the historical, ecological, and scientific importance of the last free-flowing section of the mighty Columbia River. Today, The REACH stands as a gateway to the National Monument and a unique gathering place celebrating the stories of the Columbia River basin and its people. Using indoor and outdoor exhibits, The REACH teaches many stories of this interesting region. Learn the history and culture of this interesting river town through personal accounts and artifacts highlighting how the top-secret Manhattan Project transformed the mid- Columbia region during World War II. Discover how engineers at the Hanford Site raced to produce material for the nuclear weapons that ended the war, and see how Hanford’s nuclear legacy both threatens and helps protect this unique desert and river ecosystems today. Explore exhibits that display the giant lava flows and cataclysmic ice age floods that sculpted the river’s course. Spend the day exploring this 14,000-square-foot museum, enjoying the many permanent exhibits including The Land Takes Form, The Living Land, and Manhattan Project at Hanford: 1942-1947, and more. Outdoor exhibits include Community Garden, Native Plant Communities, Columbia Center Rotary Outdoor theater, and Animals of The REACH Interpretive Trail! Sacajawea State Park is a 284-acre day-use park operated by the state of Washington and located at the confluence of the Snake and Columbia Rivers where Lewis and Clark arrived on October 16, 1805. An excellent interpretive center and museum features interactive displays that tell the story of the Lewis and Clark expedition through the experiences of Sacajawea, the young Shoshone Indian woman who accompanied the expedition. It is also the site of one of seven “confluence” installations designed by noted artist Maya Lin for the 2005 Lewis and Clark bicentennial. From the moment you enter the Franklin County Historical Museum you will be treated with true historical hospitality! Whether you choose to enjoy our collection of artifacts and information at your own pace or receive a personalized tour from one of our gracious tour guides, you will not be disappointed as you stroll through the history of our area. Marvel at the stunning architecture of the original Carnegie Library built in 1911 that proudly houses our museum. The lofty ceilings and beautifully restored ornate dark wood trim create an authentic period atmosphere. Our wide-ranging collection of historic artifacts, photographs and information help tell the story of the unique history of Franklin County. Learn about the role of the Northern Pacific Railroad in founding the city of Pasco, the county’s rich and very diverse agricultural history, the effects of three merging rivers on the local economy, and the growth of the area due to WWI and WWII. Franklin County Historical Society and Museum is a non-profit organization dedicated to saving Franklin county’s unique history. Take time during your visit to stop in our unique gift shop stocked with Washington and area souvenirs that will be sure to provide the perfect keepsake of your trip or gift for friends and family. Plan to visit us during your stop in the Tri-cities to experience historical hospitality at its finest! Established in 1988, the Pasco Farmers Market is located in the heart of downtown Pasco, Washington. From May to October, local vendors and businesses sell farm-fresh produce, hand-crafted products, prepared food, and beverages every Saturday from 8:00 AM - Noon. The market is also a place to celebrate the diversity of the local communities through live music, entertainment, and events. Expect to find fresh, locally-grown produce, beef, poultry, eggs, plants and flowers, honey, wine, bread, pastries, cookies, kettle corn, espresso, hand-crafted goods and more – all under covered pavilions for shopping in any weather! Nestled at the union of the Snake and Clearwater Rivers in southeast Washington, Clarkston is the gateway to North America's deepest gorge, Hells Canyon on the Snake River. The picturesque vistas, year-round mild climates, and a deep history make this scenic inland port a more-than-desirable stop! 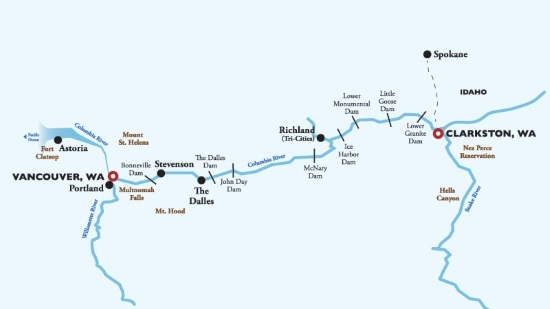 Spend the day following the footsteps of the historic Lewis and Clark journey – where the city received its name. This incredible city is filled with artifacts and stories that depict the journeys of famous explorers. Clarkston has the ideal climate for visitors to enjoy countless activities including fishing, scenic walks along the trails, shopping, and exploring! The park was established in 1965 to tell the story of the Nez Perce people. Capturing the history and culture of the Nez Perce, it is spread over four states. Discover how the people adapted and thrived allowing them to continue to prosper today. The park commemorates the admirable contributions the Nez Perce have made to preserve the sites, artifacts, and stories. Learn the full story and the role they played in shaping the future generations in culture and tradition. Explore the park’s many collections and the research center to hear more about this interesting and innovative group of people. In 2007, community volunteers constructed this reproduction of Idaho Territory’s first capital. e 1863 building was replicated from historical photos and houses a collection of Abraham Lincoln memorabilia. As you explore the interpretive center, local historians will interpret Idaho’s colorful past. Walk through and learn the history of the town and learn the legacies of the people who have lived here. In 1906, local architect James Arnot, who also designed buildings on Lewiston’s Main Street, drew the plans for this $6,000 Tudoresque home. Kjos, an early merchant, named his home “Bridablik,” which loosely translates from Norwegian as “the house up high with a broad view.” In 1910 Mr. Kjos moved to Spokane, Washington, and sold this house to E.A. White. White made many upgrades to the home, including the addition of five bathrooms, a sleeping porch on the second story, and upgrading the house from coal to gas in 1924. The home was sold three more times until Larry and Kathy Schroeder purchased the home in 2006. They have fully restored the home and were awarded two City of Lewiston Historic Preservation Orchid Awards for their work. Preserves 150 years of the county’s rich history through a historical campus that includes museum exhibits, a historic photograph collection, archives, a research library, and a beautiful historic house. Some of the incredible exhibits include, The Meeting of Two Cultures, about Lewis & Clark and the Nez Perce people; Spirit and Victory on the Homefront, that shares the Nez Perce County experience during the World Wars; and Rivers Run Through It, describing life and recreation on local rivers. The museum store has local and regional history books, souvenirs, and handmade artisan items available for purchase. After exploring the main museum, visitors are encouraged to tour the 1897 Heritage House, which illustrates an early Lewiston residence and life in a developing Western town in the early 1900s. The museum stands at the former site of Lewiston’s first permanent building, the Luna House. The Luna House served as a hotel, stage stop, and county courthouse and jail. The hotel was torn down in 1890. The current Art Deco style building was constructed in 1937 by the Works Progress administration as an office building and was converted into the Luna House Museum in the 1970s. Later, the Historical Society changed its name to better identify itself as the institution that is preserving Nez Perce County history. Thank you for cruising with us! We hope that you had a memorable experience and look forward to welcoming you aboard in the future. Enjoy Clarkston at your leisure or consider a Post-Cruise Premium Shore Excursion with airport transfer. PACIFIC NORTHWEST SPLENDOR - "Ocian in view! O! The joy!" These are the original words, and spelling of “ocean,” William Clark scrawled in his journal on November 7, 1805. One could hardly blame him for forgetting his spelling lessons in all the excitement. Experience the same sense of excitement and wonder as your journey begins in Vancouver near the Pacific Ocean, the objective of Lewis and Clark’s expeditionary party, the Corps of Discovery. You will visit many historic, scenic and enjoyable sites along your Columbia and Snake River voyage to Clarkston. If you’re looking for something tailored more to a specific interest, you might enjoy the Premium Shore Excursion to Multnomah Falls or a trip to the Western Antique Aeroplane & Automobile Museum. Port Taxes are additional and not included in the prices shown above.